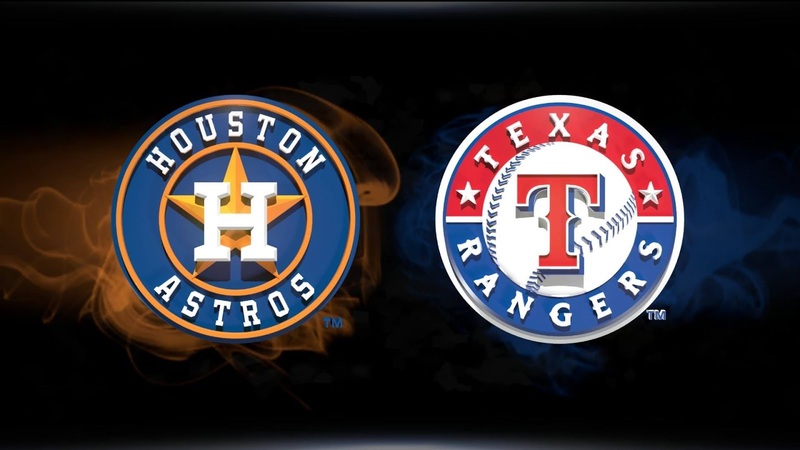 "Major League Baseball announced on Monday that the Astros' upcoming home series vs. the Rangers has been relocated to Tropicana Field in St. Petersburg, home of the Rays. The Astros will be considered the home team and will bat last, and the games will have a first pitch slated for 7:10 p.m. ET/6:10 p.m. CT on Tuesday, 7:10 p.m./6:10 p.m. on Wednesday and 1:10 p.m./12:10 p.m. on Thursday." As announced earlier today, The NFL Foundation will match Mr. McNair and the Texans' $1 million contribution to the United Way Relief Fund to address the immediate needs of those impacted by Hurricane Harvey. The total $2 million contribution will support first response efforts by the American Red Cross, Salvation Army and the United Way of Greater Houston. The NFL and the Texans will continue to closely monitor the situation in Houston and adjust the team’s plans as necessary. WILLIAMSPORT, PENNSYLVANIA (August 27, 2017) The Little Leaguers from Lufkin, Texas jumped out to an early lead with two home runs in the first inning, but that was not enough to overcome the bats of Japan, at they lost by the score of 12-2 in the Little League World Series at Williamsport, Pennsylvania. Chandler Spencer scored first on a solo home run over the center field fence on the first pitch of the game. Teammate Hunter Ditzworth also connected for a home run down the right field line to complete Texas' scoring. After that, the Japanese went on a scoring frenzy, tallying three runs in the second inning, four in the fourth, and five in the fifth. 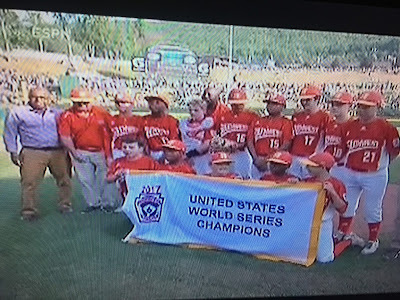 After going up by ten runs in the fifth inning, the "ten-run rule" was invoked and Japan declared the Little League Baseball World Series Champions. Lufkin, who was representing the Southwest Region of the United States, going 4-1 in their bracket while downing the Southeast Region 6-5 on Saturday afternoon to take the United States title. They beat Great Lakes 5-1 on August 17 and New England 6-3 on August 20 before falling to Southeast 2-1 on August 23. They came back and won their next two games; 14-4 against New England on August 24 and 6-5 versus Southwest on August 27 to win the USA title. Tsubasa Tomii earned the win for Japan. He threw five innings, surrendering two runs, three hits, striking out nine, and walking one. Chip Buchanan took the loss for Southwest, throwing 3.1 innings, surrendering five runs, seven hits, striking out three, and walking one. Remnants of Hurricane Harvey forces cancellation of HS football games. DEER PARK-PASADENA, TEXAS (August 27, 2017) With the remnants of Hurricane Harvey pounding Houston and the Gulf Coast area, numerous school districts have cancelled classes and activities scheduled for the coming week; August 28 to September 2. 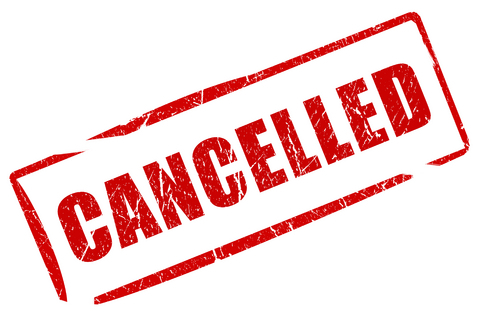 The following high school football games have been cancelled, with many more likely to be coming. Please check back for updates. NEW ORLEANS, LOUISIANA (August 26, 2017) The Houston Texans posted 246 yards of total offense, but could not find the end zone, as they dropped a 13-0 decision to the New Orleans Saints in the third preseason game for both teams on Saturday, August 26, 2017. The fans at the Mercedes-Benz Superdome in New Orleans saw the saints score one touchdown and thw field goals to raise their preseason record to 2-1. 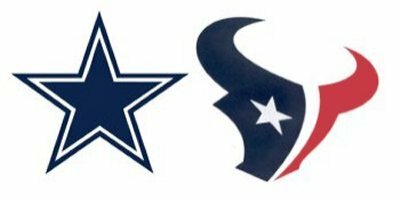 The Texans fell to 1-2 with their final preseason game against the Dallas Cowboys on Thursday, August 31 at NRG Stadium in Houston. Three quarterbacks saw action for the Texans, with rookie Deshaun Watson (No. 4, shown above) completing 11-of-21 passes for 116 yards and one interception. Tom Savage, in limited action, was 10-off-16 for 79 yards, while Brandon Weeden completed two passes for 16 yards. The New Orleans' scores were the result of two field goals of 26 and 48 yards by Wil Lutz and a three-yard run by rookie Darius Victor. The Texans kick off their regular season on Sunday, September 10; hosting the Jacksonville Jaguars. WILLIAMSPORT, PENNSYLVANIA (August 26, 2017) Coming back from a 5-0 deficit after three innings, Lufkin posted two runs in each of the final three innings to down North Carolina by the score of 6-5 to win the Little League Baseball United States Championships at Lamade Stadium in Williamsport, Pennsylvania on Saturday, August 26, 2017. As a result of the win, they will face Japan on Sunday, August 27, for the Little League Baseball World Series International Championship. North Carolina, who was representing the Southeast Region, jumped out to a 5-0 lead after three complete innings; scoring two runs in the second inning and three in the third. Lufkin, who is representing the Southwest Region, tallied their first two runs in the fourth inning on a two run home run by Clayton Wigley. Mark Requena homered in the sixth inning to add to Lufkin's scoring streak. Right hander Chip Buchanan received the win for Lufkin; throwing 1.1 innings in relief while striking out two. Collin Ross started the game for Lufkin. He tossed 4.2 innings, surrendering five runs, eight hits; while striking out five. The players from Texas will face a Japanese team that swept through the international bracket with a 4-0 record. They defeated Australia 8-0 on August 18, followed by an 4-1 win over Asia-Pacific on August 20. Their next victory was a 10-0 drumming of Canada on August 23. They closed out their international schedule with a 5-0 win over Mexico to win the International title earlier in the day (August 26). Game time is set for 3 PM CDT on Sunday, August 27. Houston Texans on a two-yard pass from Tom Savage. HOUSTON, TEXAS (August 19, 2017) In a game that saw a good amount of give-and-take action the Houston Texans battled the New England Patriots to a 27-23 win in front of 71,504 fans at NRG Stadium in the first home appearance for the Texans in 2017. The win pushes the Texans pre-season record to 1-1, while the 2016 Super Bowl Champions fall to 0-2. Hosuton will return to pre-season action on Saturday, August 26 against the New Orleans Saints at Mercedes-Benz Superdome in New Orleans. In their final pre-season game of 2017, they will return home to face the Dallas Cowboys on Thursday, August 31, 207. Both games are scheduled for a 7 p.m. CDT start. The game saw a large amount of ppalying time by players hoping to make both team's rosters. Afetr both teams played a series of downs, the Texans scored in their second possession when Tom Savage connected with a pass to Jaelen Strong for a touchdown. Nick Novak split the uprights for the extra point to give the Texans a 7-0 lead at the 1:13 mark in the first quarter. Savage drove the ball 58 yards in 11 plays in 6:48. In their first possession of the game, they moved the ball 79 yards in a drive that ended on a fourth and six play with only a two-yard game. At that point, the Patriots took over and advanced the ball 17 yards before being forced to punt, giving Houston their second possession of the game. The Patriots came right back in the second quarter to even the score when Tom Brady engineered a 75-yard drive that ended in a 22-yard pass to Rex Burkhead for the Patriots' first touchdown. Stephen Gostkowski kicked the obligatory extra point to tie the score at seven. After the kickoff, the Texans replaced Savage with rookie Deshaun Watson, who took the reins of the Texans. He drove the ball seven yards before having to punt. New England took possession of the ball and advanced 38 yards before settling for a 38-yard field goal by Gostkowski with 9:53 remaining in the first half. After the kickoff, Watson took the Texans 62 yards before Ka'imi Fairbaim booted a 31-yard field goal to tie the score at 10 at the 5:11 mark in the second quarter. The Patriots added three more points right after the two-minute warning with a 51-yard Gostkowski field goal to take a 13-10 lead into the locker room at halftime. one touchdown, in limited action, against the Texans. New England added another field goal to their total at the 6:03 mark of the third quarter with a 42-yard Gostkowski attempt. On their next possession, the Texans drove 75 yards in five plays, which was capped by a two-yard run by Watson. The Houston drive was highlighted by a 63-yard pass from Watson to D'Onta Foreman to set up the score. Novak added the extra point to give the Texans a 17-16 lead at the 4:18 mark in the third quarter. New England took the kickoff at the 25-yard line and on the first play, Jimmy Garoppolo was sacked for a seven-yard loss, causing a fumble which was recovered by rookie Matthew Godin on the Patriots' 18-yard line. The Texans turned the possession into a 35-yard field goal by Fairbaim to take the score to 20-16. The Patriots responded with a 10 play, 83-yard drive; resulting in a 25-yard Garoppolo pass to D.J. Foster for the score. With the kicking extra point, New England regained the lead 23-20. The Texans were not content to let New England remain in the lead. After the Texans had a series on down, the ball went over to the Patriots. On the first play for that set of downs, Garoppolo had an intended pass for rookie Cody Hollister was intercepted by Denzel Rice at the New England 43-yard line. He returned the interception 39 yard to the Patriots four-yard line. On the very next play, Foreman rushed the final four yards for the score. Novak added the conversion to take a 27-23 lead with 11:07 remaining in the game. Savage saw limited action in the first half, completing 8-of-9 passes for 89 yards and one TD. Brady's appearance was similar to Savage's, going 6-of-9 for 67 yards and one touchdown. Watson completed three-of-10 passes for 102 yards. Quarterback Brandon Weeden saw action late in the game, completing five passes for eight yards. Ellington led the Texans in receiving, catching four passes for 93 yards, while Alfred Blue had five carries for 20 yards. BATON ROUGE, LOUISIANA (August 19, 2017) Saturday night’s National Pro Fastpitch championship series begins as it should be with the two best teams all season long battling it out for the Cowles Cup. The Pride with just nine losses all season dispatched of the Chicago Bandits in a series sweep on Friday evening. The Bandits had won the two previous Cups. The Scrap Yard Dawgs finished second in the regular season and took the series sweep over the Akron Racers to advance to Saturday night’s game one. So how do these two teams match-up? Both these teams can stroke the ball. Both these teams can hit for power. Both these teams can produce the timely at bat. The Scrap Yard Dawgs in their series winning game against Akron only had three hits but two of those three hits drove home runs and a bases loaded walk produced the other. Three of the Pride’s eight hits in their series win came with runners in scoring position and resulted in two RBI. Pitching was stellar on both sides in their series wins. The Dawgs allowed Akron just one hit with two outs and one hit with runners on base and none with runners in scoring position. The Pride were just as prodigious allowing Chicago no hits with two outs in seven at bats and just one hit with a runner on base. The Dawgs have Monica Abbott and that’s about all that needs to be said. This season the southpaw has appeared against the Pride three times with two starts. With a record of 1-1, Abbott has allowed 11 hits over 19 innings with 38 strikeouts against 10 walks. Overall, the Dawgs have a 2017 record of 2-8 losing six in a row with five runs scored against the Pride. Experience has to count for something. The Pride are seeking their fourth Cowles Cup and their first since 2014 when current Dawgs head coach Gerry Glasco was the USSSA head coach. The Scrap Yard team despite this being only their second season in the NPF have built a team for the championship. With a mix of veterans including players like Brittany Cervantes and the right amount of youth like Ali Aguilar combined with mainstays like Megan May Whitley, the team is poised to make history in Baton Rouge. HOUSTON, TEXAS (July 23,2017) The HBU Huskies kick off the 2017 season with four road games before returning home to Husky Stadium on October 7 to face Southland Conference foe Central Arkansas on Family Weekend. The Huskies first game will be on Saturday, September 2 against Texas State, followed by a cross-Houston matchup versus Texas Southern at BBVA Compass Stadium on September 7. They closeout September, and their road trips against Abilene Christian (September 23) and McNeese State (September 23). October includes three home games beginning on the 7th On Family Weekend against Central Arkansas. 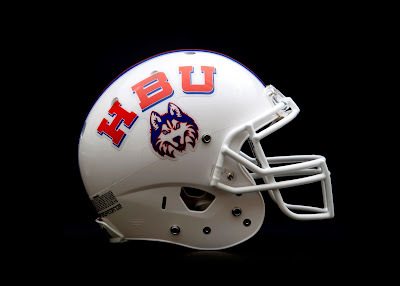 The following Saturday (October 14), Southeastern Louisiana coming to Husky Field. They will again hit the road on October 21 to take on Stephen F. Austin; returning home on October 28 to closeout the month with Homecoming against Northwestern State. Three games are on the schedule for November with two road games; Nicholls State on the 4th and Sam Houston State on the 18th. Their final home game will be on November 11 against the Lamar Cardinals on Senior Day/Military Appreciation Day. Head coach Vic Shealy talked at the recent Southland Conference Media Day about starting the season with four-straight road games. "It’s a unique situation…you can sit around and cry about it or go out there and beat somebody. It’s all about process versus product…early on our process was to build leadership and confidence, and for our players to walk on the field with an expectation to win…now we believe we have the ability to go out and beat any given team on any given day." The Huskies are picked ninth in the Southland Conference Preseason poll in the eleven-team conference. CONROE, TEXAS (August 16, 2017) Last season, the Scrap Yard Dawgs surprised the National Pro FastPitch world by making it to the championship tournament along with perennial powers USSSA Pride and the Chicago Bnadits. The Dawgs pushed the Bandits to the limit before bowing out one game short of the tile series. This season there are no surprises as the Scrap Yard Dawgs begin their championship playoff run on Thursday night against a familiar foe, the Akron Racers. In their inaugural season (2016), the Dawgs had an outstanding season by any measure but in the end, they did not hoist the Cowles Cup. For Dawgs owner/general manager Connie May, it’s all about winning the title so like any great organization, the Dawgs went out and added pieces to make this year, THE YEAR. One might even go so far as to say they rebuilt the team after one season. Now with the Dawgs just four games from wresting the Cup from the defending champion Bandits, here are three reasons that that should be a reality in 2017. 1) Last season, the Dawgs couldn’t hit worth a lick especially when it came to consistent, timely hitting. As a team in 2016, the SYD hit a paltry .254. After the conclusion of the season general manager Connie May set out to fix that problem. Fast forward to now and you have a club that was more than respectable during the regular season. It’s now a lineup filled with dangerous bats up and down the order and on the bench that that raised the average up nearly 30 points (.283). Those bats produced 113 more at bats resulting in 70 more hits and 34 more runs. It’s production like that that wins ballgames at the most opportune times. 2) Monica Abbott is the franchise and for two seasons she has put the team on her shoulders figuring in 39 of the team’s 60 wins over the last two years. Along the way, the million dollar southpaw has been worth every penny racking up 380 strikeouts in 240.2 innings of work with an earned run average below one. This season the coaching staff has worked hard to ensure that Abbott is fresh and ready for this playoff run. 3) No team wins without a championship mentality and the Srap Yard Dawgs have it. In the offseason, May made the most critical move necessary to create a culture that was focused on winning titles and winning as a team. She hired Texas A&M assistant coach Gerry Glasco. Softball fans will remember that Glasco was the head coach of the USSSA Pride that won the 2014 NPF regular season and championship title. His team Southern Force Gold won the 2008 18U National Championship. One need to look no further than his time with the Aggies to understand the impact he has on a club. In 2014, his first season in College Station, the team powered 67 home runs and 287 RBI in 60 games. Just a season ago, the Aggies rewrote their offensive record books breaking five single season records and seven school records in SEC play. Add two assistant coaches Jimmy Kolaitis and Joe Guthrie with resumes as prolific as Glasco’s and the foundation for a championship has been set. May didn’t stop there. She hired Mike Steuerwald as the assistant general manager. All the Los Angeles, California native has to his resume are back-to-back Cowles Cup championships as head coach of the Bandits and another as an assistant. Then came the players by trade, by draft and by and by free agency. Brittany Cervantes, Hannah Flippen, Anisa Urtez, Morgan Zerkle, Ali Aguilar, Katiyana Mauga, Allexis Bennett, Amanda Kamekona, Kasey Cooper and maybe the most biggest one of all left-hander Cheridan Hawkins. Yes, the Pride, the Bandits and Racers are all legitimate contenders for hoisting the Cowls Cup on Sunday August 20, 2017 but if the Dawgs are the ones sipping champagne the season will be incomplete. 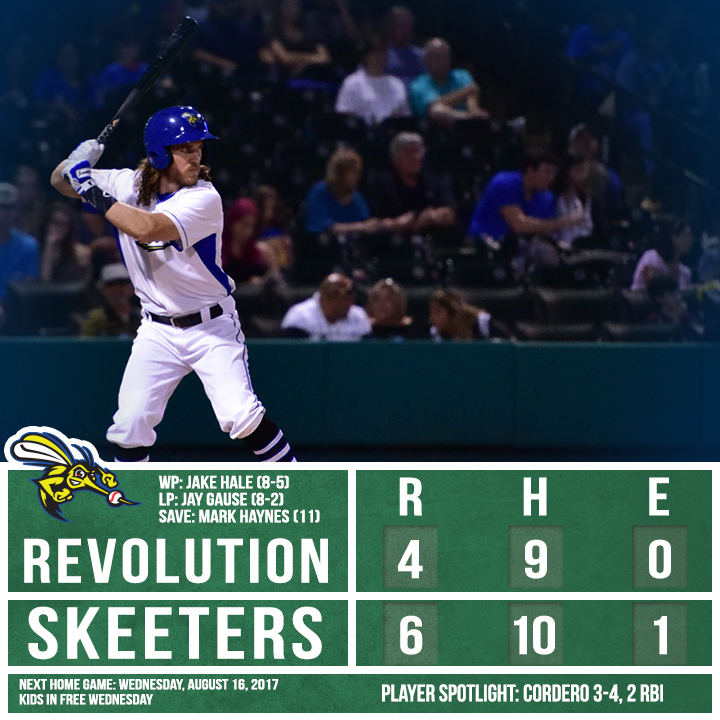 SUGAR LAND, TEXAS (August 16, 2017) The York Revolution knocked in three run in the first two inning, but the Sugar Land Skeeters connected for three runs in the third inning and added single runs in the fourth, fifth, and seventh inning to take the first game of their current home stand by the score of 6-4 at Constellation Field on Tuesday, August 16, 2017. 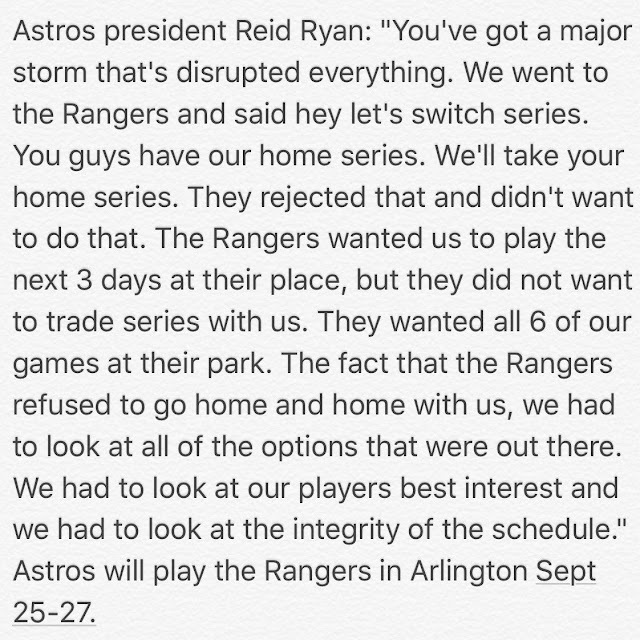 They will continue the series on Wednesday, August 17 with a 7:05 p.m. CDT. Skeeter first baseman Travis Scott was 2-for-3 while Albert Cordero and Joe Benson added two RBI each. Jake Hale earned the win, pitching the first six innings, giving up three earned runs while striking out six. York starter Jay Gause received the loss. Mark Haynes, pitching one inning in relief, received the save. HOUSTON, TEXAS (August 13, 2017) The Houston Dash and FC Kansas City battled for 83 minutes until a ball met the back of the goal as Kansas City downed Houston by the score of 1-0 at BBVA Compass Stadium in Houston on Sunday, August 13, 2017. The win pushed KC to 4-8-5 for 17 points while the Dash drop to 6-9-2 (20 points). Both teams battled for the first 45 minutes without being able to find a way around each other's defense. The deadlock continued in the second half until the 83rd minute when Kansas City forward Shea Groom headed a crossing pass into the net past Dash goalkeeper Jane Campbell for the score. It was the second goal of the season for the 24-year-old who played her college ball for Texas A&M University. The Dash were still without the services of Kealia Ohai, Lydia Williams and Morgan Brian. Ohai is out with a SEI-torn ACL in her left knee with Williams suffering from a grade one quadriceps strain in her right knee. Brian is sidelined with tendinitis in her right groin. Houston won the first encounter between the clubs 2-1 with goals from forwards Rachel Daly and Nichelle Prince on July 2. Next up for the Dash is a Wednesday, August 16 road game against Boston. 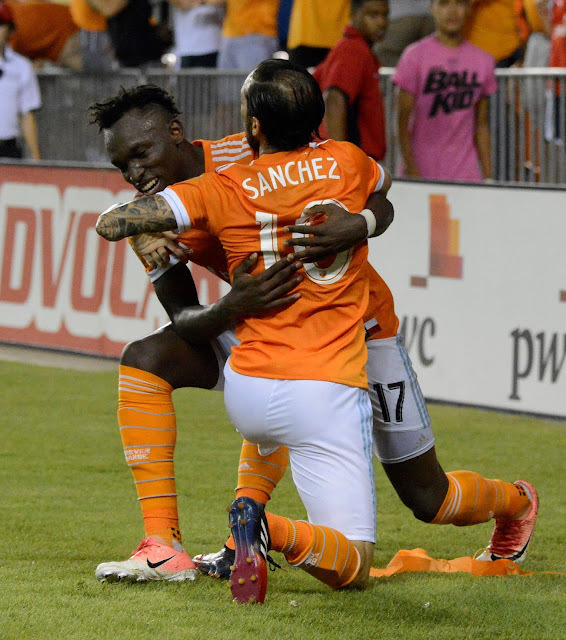 HOUSTON, TEXAS (August 13, 2017) The Houston Dynamo surged to the top of the Western Conference table with a 3-0 win over the San Jose Earthquakes on Saturday night. The win kept Houston unbeaten at home in 2017. 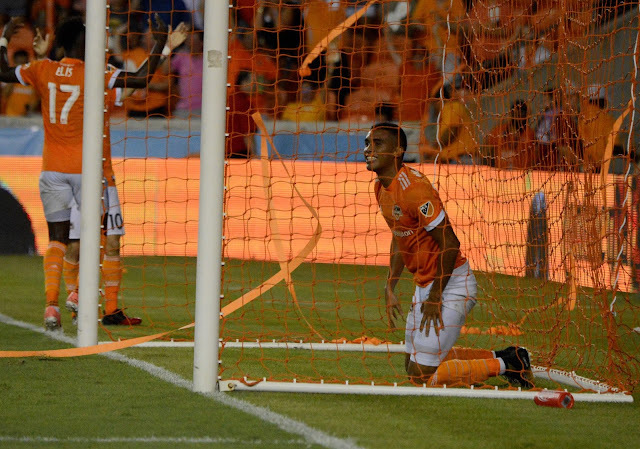 The three goal outburst gives the Dynamo 31 goals in 12 matches at BBVA Compass Stadium. Houston extended its unbeaten streak to six games and created a three way tie atop the standings joining Kansas City and Seattle with 37 points each. San Jose remained in the sixth and final playoff spot. A mostly uneventful 20 minutes opened a match that finished in spectacular fashion as the Houston Dynamo remained unbeaten at home in 2017. La Pantera, Alberth Elis, gave Houston the lead heading home a corner from Boniek Garcia in the 21st minute. The corner followed a brilliant save by San Jose keeper Andrew Tarbell as he tipped a rocket by Houston forward Romell Quioto’s drive over the crossbar moments earlier by to keep the match level. The marker was the 17th Houston has scored in the first 30 minutes of a match in 24 games this season. Elis, the youngest player in MLS this season to record a goal and an assist finished with a goal and assist for the second time in 2017. Quioto nearly had his own goal eight minutes as his shot seemed destined for the far post before Tarbell scrambled over to knock it clear. The Houston pressure continued into the early minutes of the second half as Houston drew a penalty kick in the 49th minute. San Jose defender Andres Imperiale pulled down Dynamo striker Erick Torres as he broke free inside the box. Torres PK conversion was denied as Tarbell guessed right keeping his team in the game that is until the 86th minute. Sanchez entering in the 78th minute needed just eight minutes to make his presence felt. The 37 year old was on the receiving end of a perfect ball from Elis who had attacked into the six yard box before slipping the ball to Sanchez for the tap in. The goal was the Uruguyan’s first in MLS play. Mauro Manotas, the young Colombian phenom, notched his career high eighth goal of the season in the fourth minute of second half stoppage time to cap the win. Tomas Martinez, making his MLS debut, set up the play with a nicely weighted ball to Sanchez. Houston forwards have accounted for 31 of the team’s 42 goals this season. Houston returns to the pitch on Saturday August 19, 2017 against the Vancouver Whitecaps FC. Kick-off at BC Place is set for 9:00pm CST. Photo by Darla Tamulitis, La Vita Loca Photography, Copyright 2017, All Rights Reserved. HOUSTON, TEXAS (August 12, 2017) The Houston Dynamo pushed the San Jose Earthquakes to the limit fro 90-plus minutes, as the downed their MLS rival by the score of 3-0 at BBVA Compass Stadium in Houston, Texas on Saturday, August 12, 2017. The win raised their season record to 10-7-7 (37 points) with 10 games to go in the season. After some spirited play leading up to the 39th minute, Elis was issued a yellow card for simulation (dive in the box). That means he will miss the next match against Vancouver on Saturday, August 19. After three minutes of added time in the first half, both teams retired to their respective locker room for halftime, with Houston retaining their 1-0 lead. In the second half, both teams poured on the attack without much success until the 89th minute. At that time, Vincente Sanchez, who came into the game in the 78th minute as a replacement for forward Romell Quioto, received a pass from Elis, and drilled it pass Earthquake goalkeeper Andrew Tarbell. They added an insurance goal in the fourth minute of added time when an offense assault by Houston resulted in a three-player play that ended with Manotas sliding the ball, along with himself, into the goal to secure the win and three points for the Dynamo. With Ricardo Clark starting the game, it marked the 10th season in his career in which he has started 20 of more games. It also moved his career regular season starts to 311, which places him eight starts from the top 10 in league history among field players. In addition, Juan David Cabezas started in the 18th consecutive game. As a result of the win, the Dynamo move into first place in the Western Conference of MLS. They next face Vancouver on the road on Saturday, August 19, followed by an August 23 match up against Dallas. They will return to BBVA Compass Stadium on August 26 when they will face Sporting Kansas City. 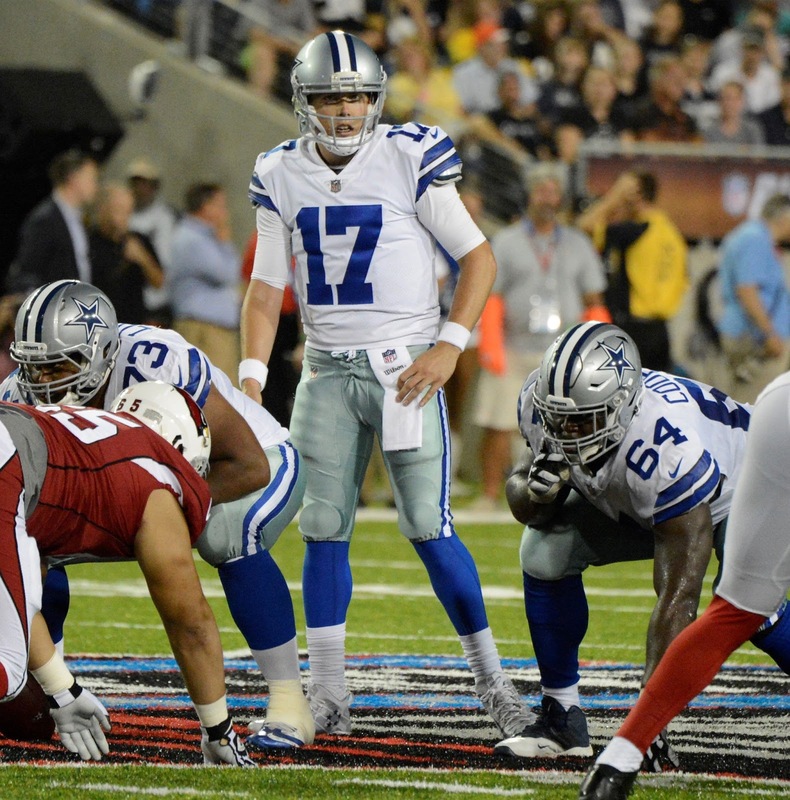 CANTON, TEXAS (August 3, 2017) The Cardinals scored 15 points in the first quarter, but it was not enough to stop the Cowboys in the second half as Dallas came from behind to down Arizona 20-18 in the Pro Football Hall of Fame Game at Tom Benson Hall of Fame Stadium in Canton, Ohio on Thursday, August 3, 2017. The Cowboys quickly came back on their next possession and drove 89 yards in 3:54 to get on the scoreboard. Quarterback Kellen Moore connected with tight end Rico Gathers on a 26-yard pass for the touchdown. Sam Irwin-Hill split the uprights for the conversion to cut the Cardinals' lead to eight. Dallas added three more points to their first half total when Irwin-Hill booted a 23-yard field goal to make the score 15-10 with 7:51 remaining in the second quarter. The drive covered 83 yards in 12 plays and lasted 5:36. After the Dallas kickoff, the Cardinals started their drive on their 40-yard line, after Irwin-Hill shanked the kickoff out of bounds. 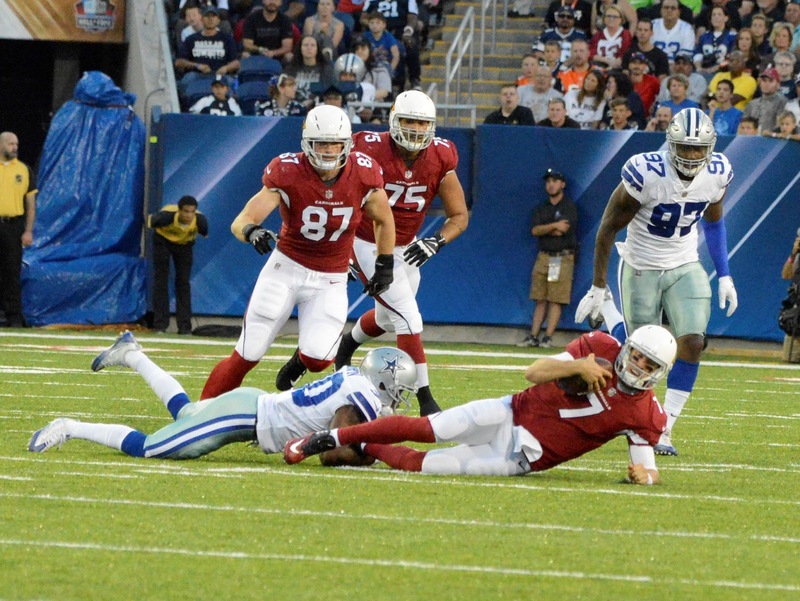 After three-and-out, the Cardinals punted with the Cowboys fair-catching the ball on their own 20-yard line. With both teams feeling each other out for the remainder of the first half, the score remained 15-10 at halftime. The Cowboys added a touchdown and two field goals in the second half to take their scoring to 20. 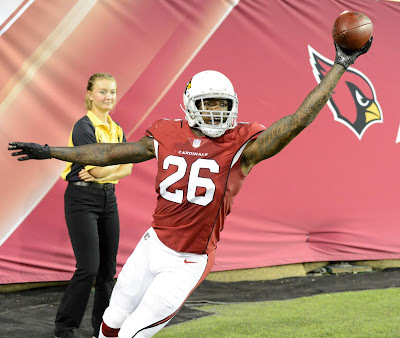 The Cardinals booted a field goal in the second half to close out the scoring. Gabbert completed 11 passes on 14 attempts for 185 yards. Rookie Trevor Knight saw some action; went 5-of-14 for 68 yards while rushing for 12 yards. Cowboy starter Kellen Moore went 12-of-17 for 182 yards and one touchdown, while backup rookie Cooper Rush was 9-of-18 for 87 yards and one touchdown. T.J. Logan led all Cardinal rushers with four carries for 24 yards while Rod Smith tallied 64 yards in 18 carries for the Cowboys. The Cowboys will next face the Los Angeles Rams on Saturday August 12 while the Cardinals play the Oakland Raiders on the same day.